Italy have been in commendable form and their latest victory came at the expense of Finland's misery. 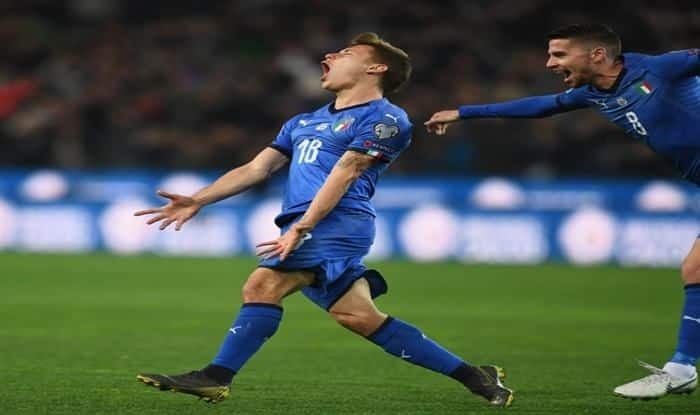 Italy began their Euro 2020 qualifying campaign with a 2-0 victory over Finland, thanks to goals by young Nicolo Barella and teenager Moise Kean. Barella, a 22-year-old midfielder for Cagliari, and Kean, 19-year-old Juventus forward, led the Italian lineup, selected by coach Roberto Mancini. The coach introduced young talent alongside veterans like Giorgio Chiellini and Leonardo Bonucci to a squad that failed to qualify for the World Cup in Russia, reports Efe news. The generational shift was illustrated by the selection of 19-year-old Serie A sensation Nicolo Zaniolo — who plays for Roma — and Fabio Quagliarella, a 36-year-old veteran currently at Sampdoria, who made a late substitute appearance. After failing to qualify for the 2018 World Cup under coach Gian Piero Ventura and a subsequent underwhelming UEFA Nations League campaign, Italy needed to begin strongly on the road to Euro 2020, a tournament where it will host the inaugural match. Playing with a 4-3-3 formation on Saturday, the Italians began aggressively against Finland, whose only victory against the Azzurri came in the 1912 Olympic Games, and scored with just seven minutes on the clock when a shot by Barella found the net via a deflection by Finnish defender Sauli Vaisanen. Italy could have doubled their lead in the 13th minute when a Cristiano Piccini shot went wide. While the hosts’ initial attacking intensity declined thereafter, but they did not concede any attacking opportunities to the Finns. In the second half, Italy almost paid for for easing off when Finnish forward Teemu Pukki had a near miss in the 67th minute. The Italians doubled their lead eight minutes later when Ciro Immobile slid a through ball to Kean, who beat keeper Lukas Hradecky to become the first player born this century to score for Italy. He also became the second youngest player ever for the Italian team, behind Bruno Nicole who scored his first international goal at the age of 18 in 1958. Quagliarella was brought on in the final minutes of the game and almost scored a third goal, hitting the crossbar. Italy will play the lower-ranked Liechtenstein on Tuesday and Finland will face Armenia on the same day.